5-in-1 Your Way Ball Play Pink Activity Gym is rated 4.7 out of 5 by 61. Remember how much FUN you had playing in a ball pit as a kid? The tossing! The swimming! Now you can bring the joy of a ball pit right to your living room. (Without offending your inner germaphobe – you know you’ve thought about it). Unlike your standard playmat, this baby mat can be adjusted up or down to create walls. Keep baby right where you want her with these plush barriers, or – you guessed it – fill the play gym with bouncy, bobbling, bubbly balls! For younger babies, the jumbo mat lays flat for tummy time. 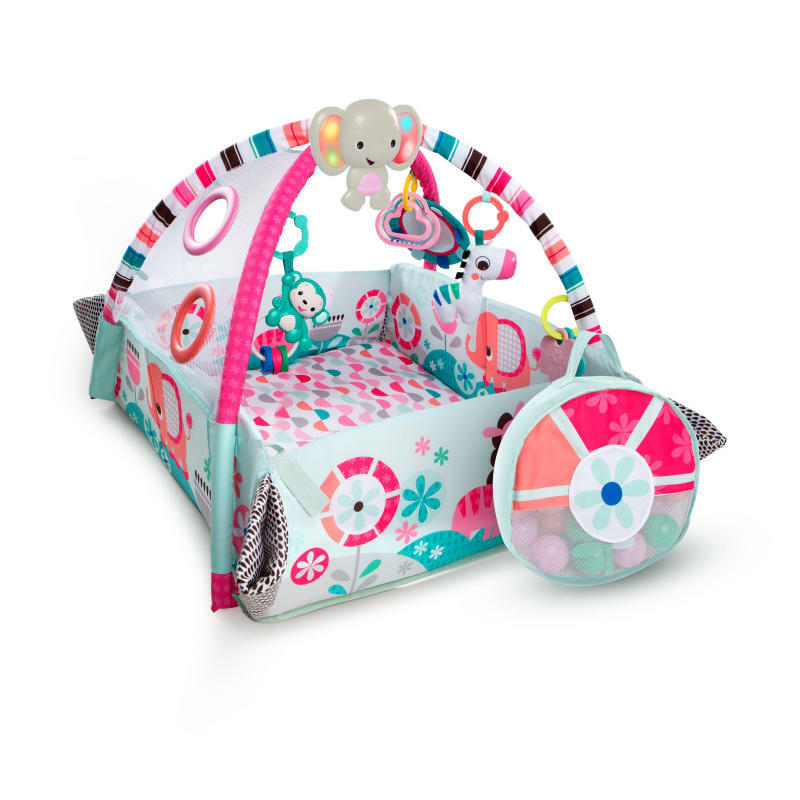 Playtime is all around with engaging toys, crinkle fabrics, rattles, tunes and more. Who’s ready to have a ball with Bright Starts? Rated 5 out of 5 by DaddyWarbucks from So much to do! This is really great - it will grow with my little one, and there is so many different things to stimulate her. It's nice and self contained, plus I don't have to worry about her crawling around in every other kid's drool at a communal ball pit. When I need a play mat, just drop the sides and voila! Worth it. Rated 1 out of 5 by Lyssap from Do Not Wash! We bought this playmat not too long ago, and it states it is machine washable, she drooled quite a lot on it so I decided to wash it and the whole corner of the mat tore- I’m so mad! Because we only washed it once, and only used it a couple of times! It makes me sad because she enjoyed the mat when she would play on it and now it’s torn :( And on top of that the play mat never came with the musical elephant!! Rated 1 out of 5 by Lyssap from Do Not Wash! We bought this playmat not too long ago, and it states it is machine washable, she drooled quite a lot on it so I decided to wash it and the whole corner of the mat tore- I'm so mad! Because we only washed it once, and only used it a couple of times! It makes me sad because she enjoyed the mat when she would play on it and now it's torn :( And on top of that the play mat never came with the musical elephant!! Rated 1 out of 5 by Cavi from Disappointed! It was suggested this product is machine washable, but it torn during my first machine wash. I am so disappointed! Rated 5 out of 5 by NicoleMaddiesMommy from Love the light up Elephant! We got this at our baby shower! My now 3 month old loves it! But her favorite is the detachable elephant! I see other play mats come with different light up attachments! I wish I could buy those separately even a second elephant as she loves it and I would love to have extras for day care, her car seat and other family members houses when they watch and I'm at work! Please reach out to me if this is possible! Rated 4 out of 5 by GillianMB from Giant play mat!! The 5-in-1 Your Way Ball Play Activity Gym has been great for us so far. Super easy to assemble. We have a few other activity gyms, but I was disappointed with how small the play surface was. This play mat will grow with your child! Lots of room for tummy time, and room to roll around when the arches are assembled. We haven't used the ball feature yet, but I already like how they are in a bag for easy storage. Although this activity gym is in pinks...there are greens as well so it isn't too overwhelmingly girly looking. I might have liked to see 5-10 more balls to fill the space a little better.